Securing branches in the Internet age can be a daunting prospect. The technology landscape is always shifting and evolving, which makes it exceedingly difficult to stay up-to-date on best practices and the most cutting-edge solutions the industry has to offer. 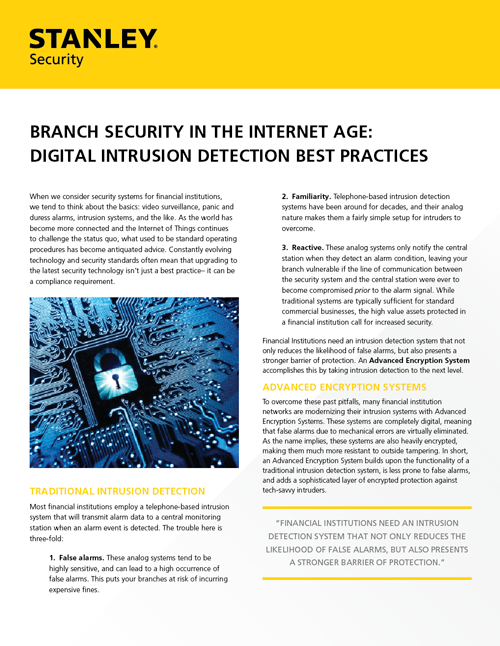 Many financial institutions have had the same analog intrusion detection systems for decades. The fact is, these systems can be extremely prone to false alarms and place too much reliance on a reactive alarm strategy. Your branches need an intrusion detection system that presents a much stronger barrier of protection. Our Advanced Encryption Systems take intrusion detection to the next level. These systems are 100% digital, heavily encrypted, and offer vastly enhanced security for your branches, staff, and customers. To learn more about how our Advanced Encryption Systems work, download our guide!